The Nigerian Terrorism (Prevention) Act was passed in 2011. However, 2014 has seen a sharp increase in acts of terrorism within Nigeria, which has cost the lives of at least 1500 people and seen the recent abduction of over 200 schoolgirls. If solutions can be gleaned from the international community and human rights laws. 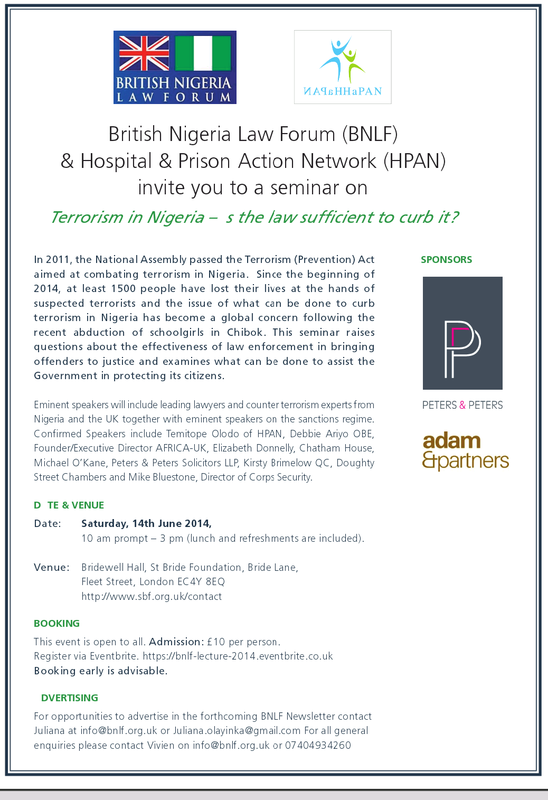 Leading legal and counter-terrorism experts from Nigeria and the UK. Top government officials (including the Nigerian Inspector-General of Police) have been invited. Admission: Eventbrite link to follow. The event is to be covered by UK and Nigerian media. More information on this event is to follow. The BNLF is a professional organisation that aims to strengthen the relationship between the British and Nigerian legal communities.